The lovely and talented Christina of Christina Lowry Designs is holding an amazing series of giveaways to promote makers of handmade goods and I am super honoured to be taking part. 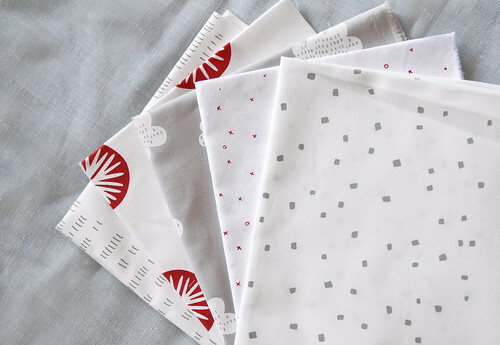 Head over to Christina's blog today to enter to win a festive set my handprinted, 100% cotton panels, perfect for Christmas sewing. And it's been such a splendid year around here that I thought I'd like to do a wee holiday giveaway as well. Leave a comment here on this post and on Monday, December 10th I will randomly choose someone to receive another set of the above prints (open to anyone worldwide). Two chances to win, folks! Comment are now closed and a winner has been chosen, thanks everybody!! My Christmas sewing would be so special if I could add some of your handprints! What a great giveaway, it is such beautiful work. You have inspired me so much this year and got me completely hooked on handprinted fabrics - thanks!! This is such a lovely giveaway! Thanks! Merry Christmas! Such a generous giveaway! I love your prints and have plans to make many quilts using them! These are lovely! Thanks for another chance to win! what a lovely giveaway - love the fabric! Lovely giveaway. Thank you. And have a lovely Christmas. Oh, such a beautiful, crisp and calm set of designs! Pure love! And just a perfect expression of winter. these are just beautiful! thanks for sharing. Love the designs, the prints are so pretty! Ohh put me on the list. And do tell me when the market season slows there will be a handprinted fabric swap III. Oh, I'm very thankful you are doing this! You see, I just won one of Christina's giveaways and thought I wouldn't enter any more, but I love your fabrics, so I'll enter here! Thanks! thank you for your wonderful postings this year - so inspirational and such beautiful designs and colours. well done, best wishes and merry christmas to you and your family!! So pretty, I'd love to have some of your fabric! I would love to win some of your fabric! So wintery. Oh, yes please enter me! I have screenprinted myself but a far cry from your beautiful designs!!! Thanks for the chance to win! Great prints! I would love to win the giveaway. Beautiful prints...thanks for the sweet giveaway! Gorgeous fabric as always... Your designs are really beautiful. I just recently discovered you but I am already a great fan of your work! Thanks for the opportunity to win! Love the color palette on these - beautiful! Thanks for an awesome giveaway. A lovely combination of prints. I covet these fabrics and wouldlo e to work with them. Thank you! Your fabric is so lovely! These prints just make me smile! I really should just buy your prints, I love them so, but a win is even better! Best wishes on your show this weekend and thank you for the giveaway. I appreciate your beautiful designs, spatial arrangement and colours. Beautiful. You are very talented. Have a wonderful Christmas. oh, what great colors!!! congratulations on all you've done this year! Lucky me a extra day to enter. Love, love, love these designs. Thanks for the chance to win. I hope you are having a good relax now! I love my fabrics, can't wait to make a quilt for our bedroom with Maze and Vale, Ink and Spindle and Umbrella Prints fabric, yay! can't resist! Sounds like Finders Keepers went well... hope you're managing to have a good rest now! Ohhh I've been collecting fabrics for my own personal quilt for a long time, and these beautiful fabrics would be perfect to finish that collection!